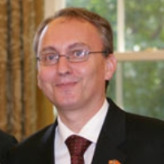 Zoran Jolevski has served as Macedonia’s Ambassador to the United States since March 2007. Jolevski received his Bachelor of Economics , his Master of Science in Law and his PhD in International Economy from the University of Sts. Cyril and Methodius in Skopje, Macedonia. He speaks English, Serbo-Croatian, Bulgarian, and some French. From January 1983 to January 1988, Jolevski worked as a freelance tour director. From January 1988 to October 1994, he served in the Ministry of Foreign Affairs, first as responsible officer for preparing all necessary documents for observer status of Macedonia in GATT, as well as desk officer for the UK and Germany (1988-1992) and then as secretary to the Coordination Group on Ex-Yugoslavia Succession Issues (1992-1994). From 1994 to 1998, Jolevski served as first secretary for the Permanent Mission of Macedonia to the World Trade Organization and the United Nations Office at Geneva. From September 1998 to December 1999, Jolevski worked in the Ministry of Foreign Affairs, first as Deputy National Coordinator on Humanitarian Issues for the Kosovo refugee crises and then on WTO accession and other international trade and financial affairs. He was an assistant to Macedonian President Boris Trajkovski. From January 2000 to May 2004, he served as chief of staff of the cabinet of the President of Macedonia and as Chief Adviser to the Minister of Economy on WTO accession. In May 2003, he taught international economic relations and foreign trade at European University. From 2004 to 2006, he served as chief of party “WTO Compliance Activity” and then “Macedonian Business Environment Activity” for two USAID funded projects involving Booz Allen and Hamilton.